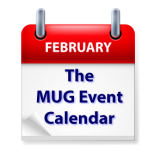 At the top of the list on this week’s MUG Event Calendar are appearances by Ray McKenzie of The Apple Store and Chuck Joiner of MacVoices, both at an Illinois group, Adam Christianson of The MacCast at a Texas group, and Gary Rosenzweig of MacMost at a California group, but that’s hardly all that’s happening. Net neutrality will be covered in Connecticut, fighting online fraud will be the topic at a Nevada group, and iOS money saving apps will be reviewed in New Jersey. Wednesday 7-Feb Chicago Macintosh Users Group – What kind of company is Apple?